PORTLAND, Maine — Attorney General Janet Mills will be the state’s first female governor after Tuesday’s election, giving Democrats their first electoral victory for a statewide office since 2006 and putting them in a position to roll back the conservative legacy of Gov. Paul LePage. Nobody has been a bigger LePage foe than Mills, the middle child in one of Maine’s famed political families. Her father was a U.S. attorney and an ally of Margaret Chase Smith, the legendary Mainer who was the first woman to serve in both houses of Congress. Mills, 70, of Farmington is the oldest person to ever be elected Maine governor, according to the Maine Law and Legislative Library. She has spent nearly half of her life in public service and became Maine’s first female district attorney in 1980 and the first female attorney general. 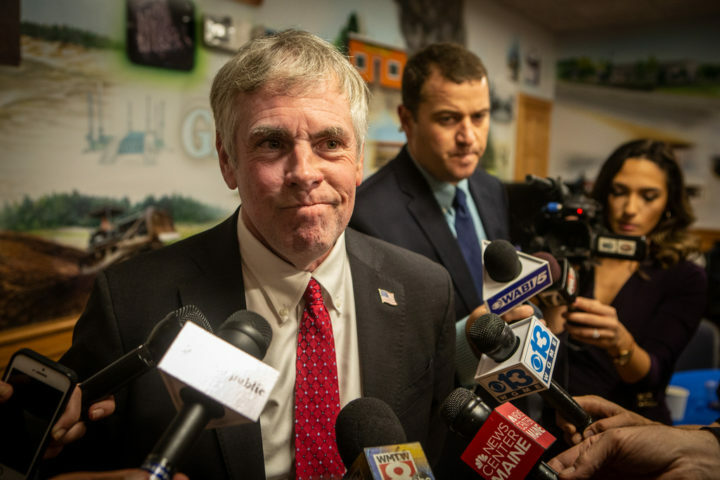 With roughly 85 percent of precincts reporting results to the Bangor Daily News by noon Wednesday, Mills held 51 percent of the vote to 43 percent for businessman Shawn Moody, a Republican who promised to carry on LePage’s legacy. Moody conceded the race to Mills early Wednesday. The Bangor Daily News and Decision Desk HQ called the race shortly afterward. Independent State Treasurer Terry Hayes had garnered 6.1 percent of votes to finish last after a campaign dominated by liberal chatter that she could spoil the race for Mills. Ranked-choice voting passed by referendum in 2016 partly as a response to LePage’s two plurality victories, but it wasn’t used in November state elections because of constitutional conflicts. Mills didn’t need it to wrest the Blaine House from LePage. During her campaign, she promised a course change in Augusta that would include implementing the voter-approved expansion of Medicaid to an estimated 70,000 Mainers under the Affordable Care Act, which is now stalled in a court battle between the governor’s administration and advocates. As she made her way through the eight-way Democratic primary in June, Mills had to navigate past stances that are out-of-step with her party’s modern base. For example, Mills said she was “proud” that all Democratic candidates got F grades from the National Rifle Association, though the same group gave her high marks as a legislator during the early 2000s. Republican Shawn Moody concedes the Maine governor's race early Wednesday morning at his headquarters in Gorham. Her race with Moody was largely about LePage’s legacy. Mills pointed to a weak demographic outlook and a state forecast projecting just 100 new jobs between 2016 and 2026 as a reason to “turn the page” on the governor. Moody touted a record-low stretch of unemployment as a main reason for no course change. Mills released an economic roadmap in September aimed at her first year in office. She wants to combine 15 agencies responsible for fragments of Maine’s economic development picture, elevate the governor’s energy office to a Cabinet-level department and give loans to small businesses to finance the addition of new employees. Republicans hammered Mills as a tax-raiser during the campaign, but she said late in the campaign that she would propose a two-year budget in 2019 that wouldn’t raise taxes. When asked on Friday if that pledge would apply to high earners, she reiterated the pledge. Teagan White of Bar Harbor said at the polls on Tuesday that she had been prepared to vote for independent Alan Caron in the governor’s race before he dropped out last week. But she picked Mills in the end, saying she wanted to counterbalance Republicans in Maine and in Washington. BDN writers Jake Bleiberg and Seth Koenig contributed to this report.